I was wondering if you can use the Hershey’s “Special Dark” cocoa powder. The difference is that the Special Dark is dutch chocolate. I’ve used both the Special Dark and regular cocoas and both batches came out perfectly! My dough was completely awful. It was runny like brownie batter.. not good cookie dough at all. I’m not sure what went wrong, but I’ve baked dozens of batches of vanilla cookie dough and was hoping this would be a good recipe to try for my kids, but it was terrible. I’m sorry to hear that. With all due respect, something must have been off in your measurements, the dough is not runny. I just made this and mine wasn’t right either. It was not runny but there was no way that I could roll it out. The dough does taste delicious though as I’m eating it on my kitchen floor while drinking champagne. Heartbroken because I was excited to make these. Perhaps it’s the measurements or the butter quality? Baking can be finicky and like a science. If I try new cookie recipes and the dough is too sticky, I just add flour until I like the texture. Glad you liked the taste and hope the baking experience is better next time! This is the BEST. My go to recipe and always requested by family members. Love the way the dough holds its shape! Also it is worth it to go for the more expensive dutch cocoa. Thanks so much for this amazing recipe! Perhaps your butter was not at room temperature but melted. That would probably cause it to be runny. I was wondering if this recipe is firm enough to use house cutouts as if to make a gingerbread house? If not, what would I change to make a more solid/firm cookie. Not a big fan of gingerbread, but these cookies are similar in color so I thought maybe I could try to make a house using this recipe? I too am interested in finding out if this would work for a gingerbread house. I just made my first two batches. They came out beautifully and taste amazing. The cookies I have are very fragile. I can’t imagine making a house out of these. what brand of Coca powder did you find to be best for these cookies? I used the Rodelle Organic Baking Cocoa (Dutch Processed) that I purchased at Costco. The flavor cannot be beat and the smell is simply heaven. It’s very dark chocolate looking. I just finished making these cookies and they turned out beautifully! The first batch was almost eaten by the Kids before the second batch was out of the oven! I’ll definitely be saving this recipe to use again! Thanks!! Best cookies to hold shape and the flavour is wonderful. I use best quality cacao over cocoa powder. Much better. There’s no way on the planet that the dough is runny. You should triple check your measurements if this dough is runny…… you’ve made an error. This is my go to recipe for chocolate sugar cookies. The best. I made these as part of my cookie extravaganza I make every holiday for the fam. I have never made a chocolate sugar cookie…no idea why? This recipe is going in my recipe roster though. They were one of the best sugar cookies I have ever made! Thank you a million times for this one! Glad to hear it Marni! Merry Christmas! Made these tonight – they are amazing! What a fun twist for a shaped sugar cookie! Want to try these. I’ve read a lot of sugar cookie recipes that have cream cheese in them. Have you tried adding cream cheese to these cookies? If so, how much would you add? I’m sorry, I haven’t tried them with cream cheese. If you do, I’d love to hear about the results! Happy baking! Made these today and they were amazing.. smells and tastes just like brownies.. the batter wasn’t thin at all but the perfect thickness for rolling out.. I rolled them out pretty thick and they cooked up just perfect and would be perfect for a replacement to gingerbread for a house.. will be making these again.. wish I could post a pic!! I’m excited to try these cookies! I was wondering though if you put icing on these or if you just leave them as is? Hi Nicole, sorry for the delayed response, just saw your comment now. I have served them as is, but mostly I decorate them with royal icing. Delicious either way, I just love decorating. I’m not a huge fan of hard royal icing myself, so I use a higher quality buttercream-style fondant (e.g., Fondarific) or modeling chocolate to decorate these and it tastes wonderful – the perfect amount of sweetness to complement the slight bitterness of chocolate. Hi I don’t see a recommended thickness for rolling out the dough. How theck do recommend for cutting out the cookies? This is the best recipe ever. I made it last year and the cookies were such a hit I am making them again. It’s fool proof. Your instructions were spot on. They really keep their shape. It’s amazing and so delicious. THANK YOU! Wonderful to hear Lauren, glad you like them! I made these tonight. They are the best cookies ever, and they’re not even frosted yet! I am really confused how anyone came out with a runny product, this dough is so thick that it bent my whisk attachment on my Kitchen Aid (my fault, should have used the paddle, thats what I get for being lazy). The dough tasted absolutely delicious! I am going to bake the cookies today, I let the dough hang out in the fridge overnight which of course has caused it to be even more firm. I will likely let it sit out for a little bit to allow it to get more pliable. For those reading about the runny results, dont let that deter you, something had to have gone wrong with their measurements. I can tell by the dough consistency that these are going to make a beautiful cutout cookie. I made a half batch of these a few weeks ago and used Green and Black’s organic cocoa. I rolled them out 1/4 inch thick. They looked beautiful and tasted fantastic! I have already transferred this recipe to my “favourites” recipe book. I’m planning to make more this weekend and will decorate the snowflake shapes with royal icing, sanding sugar and silver dragees. Thanks for all your work in perfecting this recipe! Wonderful to hear, thank you Jonathan! 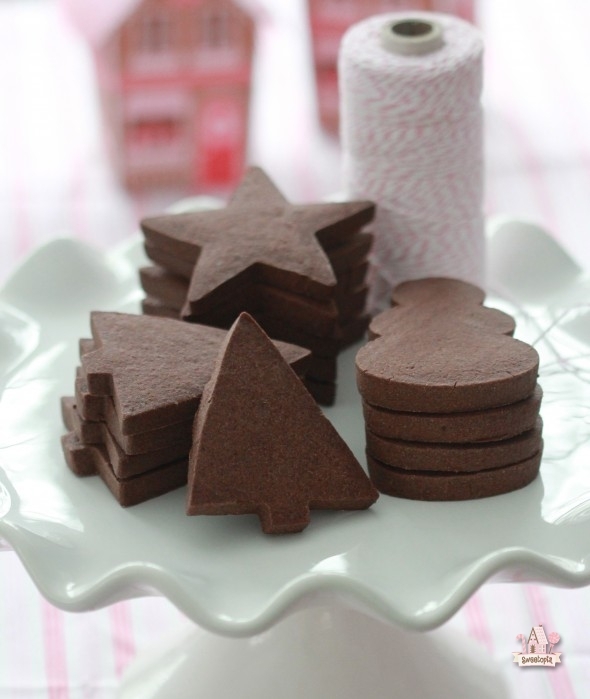 I made these last Christmas and I’m making them again now! They are great for cutouts, but I don’t know about a house (mine were soft but chewy like brownies). My little girl can’t wait to decorate them with me again! Just made another half-batch today, which yielded about 42 4″ snowflakes. Again, everything worked out perfectly. I decorated some with Royal Icing, sanding sugar and silver dragees. See my Instagram posting, jdpb82, for a look if you’d like. These are the best. The cookie I’ve always dreamed of. None have ever been chocolatey enough. These are like unfrosted Oreos. I can’t stop eating them! Thank you!!! I made these with my girls last night. We chilled them overnight and plan to bake and decorate them today. When I pulled the dough out it is rock hard! I am hoping that it softens up and will be just fine – any tips on softening hard dough quickly? Also, did I chill it too long maybe? Yes chilling makes dough hard, but it should soften enough to cut in about 15 mins. I actually like cutting my cookies when the dough is cold, I find it easier to cut them (except for small, skinny pieces on detailed cookie cutters, for those I wait until the dough is warmer). After the pieces are cut, if I have time I’ll chill them again until they harden… they keep their shape better when baked that way. I’ve made this recipe for the past three years and it turns out great every time. 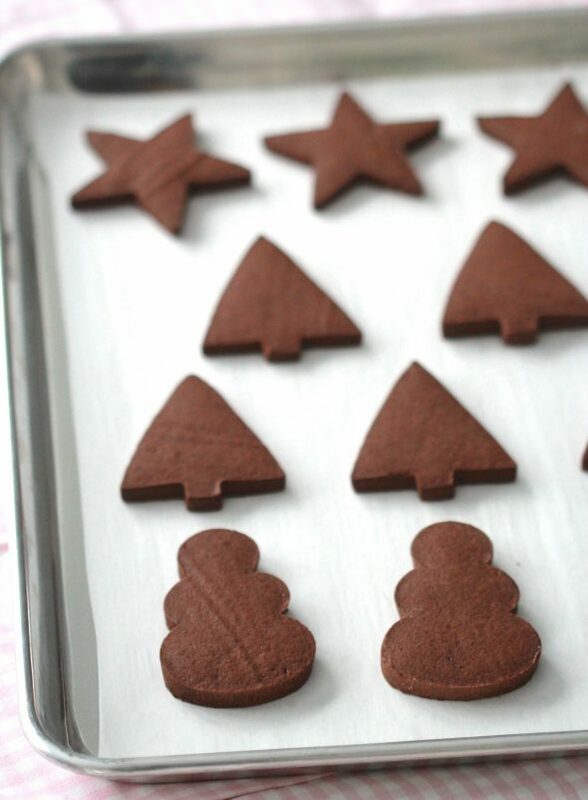 I do have a question – could I bake the cookies and then freeze before using royal icing to decorate? I have an event coming up, but I’m not sure I’ll have enough time to bake and then decorate in one weekend 100 football jersey cookies for my son’s banquet! I’m hoping to bake/freeze one weekend and decorate the next. Yes I’ve done that before! Happy decorating! Hi! I know this is quite awhile after the original comment, but is there a good amount of time to let the (baked) cookies sit out after being taken out of the freezer before decorating?? So I was making cookies to decorate for Christmas and a friend was going to help me decorate them. I had three recipes I was making. This recipe was my third type of sugar cookies. I made the dough and placed it between two sheets of parchment paper and rolled it out. I put it in the freezer to chill for a while. Then I found out my friend needed to postpone. Since things are crazy anyway before Christmas, I left the dough in the freezer where it stayed for a week (and broke into three pieces). I took it out once and let it soften and patched it back up (no big deal) and put it back in the freezer. Several days later I took it out and let it soften a while (didn’t take long). By now it’s already New Years and this cookie dough was so easy to work with, smelled fantastic, looked great and tasted delicious. I really believe this is going to be my “go-to” recipe for cut out cookies. Wonderful! I love them just plain. Thanks for sharing this recipe! I wanted to do a version of a candy cane for my granddaugther’s birthday since her name starts with a J making a regular sugar cookie twisted with a chocolate sugar cookie but decided the cutout of this would be better. Instead of vanilla can I use almond or caramel extract? Hi Kathi, yes, sure! Please let me know how you like the flavour! I used Rodelle Organics, Organic Baking Cocoa (Dutch Processed) that I purchased at Costco. This gave them a fantastic rich chocolate taste and smell. These cookies were amazing—no spreading, and absolutely delicious! My husband said they are his new favorite cookie. Hi Meg, that’s wonderful to hear! Have fun practicing! 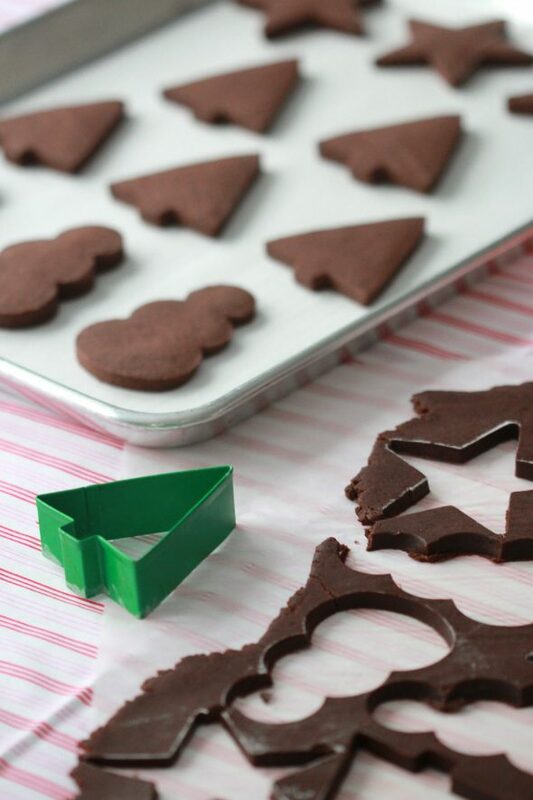 What icing recipe do you use on your chocolate cookie cutout? Can’t wait to try! Thank you! Usually royal icing, which is in my recipe section. Happy baking and decorating! Can I make the dough and then roll it out tomorrow if I store it in a air tight container? I roll mine out, cover, then put in fridge overnight. I haven’t tried that one, so am not 100% sure, but I’m guessing that it would work. I would hold off on adding the full amount of flour at first. For example, just add four cups of the flour, mix, and then see if is a wet dough, then add the 5th cup of flour. If it still is a wet dough then add more flour than the recipe calls for. I’m also guessing the flavour might not be as intense as a cocoa powder. Please let me know how it goes, I would love to know! Thanks! This recipe tastes fantastic! I’d recommend either rolling it out to the desired thickness before refrigerating or let it warm up a bit after removing it from the fridge to roll it out. It is almost impossible to roll directly out of the fridge. Beautiful consistency and amazing flavour! Will be my go to for chocolate sugar cookies! I noticed that there is no baking power or baking soda in this recepe. I made them as written. They did not lose their shape and are very dense. I did use the “Special Dark Coco” and they are very chocolate. The dough was sticky. Rolled it out between 2 pieces of parchment paper and chilled and the cut out cookie came off the parchment easily. Thank you for sharing your recipe. May i ask why it doesn’t contain baking powder or baking soda? I take the levening agent out to prevent the cookies from spreading. Still taste good and they hold their shape better! Where do I start? I made these for the first time and I followed you recipe EXACTLY…..except we have to eat gluten free in our home, so I used my fantastic cup for cup flour and they came out PERFECT!! I still have tears in my eyes. From another recipe I have an almost exact copy of Oreo filling. For the 1st time in 15 years I had a gluten free oreo that tasted like the original. Such a fantastic chocolate taste, they are great without icing. So if you have any questions about can these be made GF….YES, yes they can. Thank you for this gift. Awesome!!! So happy, my niece is also GF so it’s nice to know. Happiness! I’m so glad to hear it!! Would you mind sharing what GF flour you used for other readers please? And if anyone wants to turn your perfect chocolaty cookies into an oreo I used the recipe for the filling from Annalise G. Roberts Gluten free Baking the Classics. And so we have gained a few pounds after eating too many of these cookies!!! Beware. I forgot the most important part of the gluten free flour. You have to use Authentic Foods superfine rice flours. It makes ALL the difference. No other flour will give you the result. Just to confirm, there is no baking powder or baking soda needed for this recipe? No, I don’t use a leavening agent as it makes the cookies spread too much for a cut-out cookie. Still tastes great! I love this cookie recipe. I have been making these for about a year now and it’s my go to cookie dough for chocolate. I add about a tsp of espresso powder to this recipe and sometimes mashed up Oreo cookies chocolate/chocolate or chocolate/vanilla cream.Love this and thank you for posting! Nice idea to change the recipe up with espresso powder or Oreos! Thanks for sharing! When you scoop the flour, do you dip and sweep or spoon it in to the measuring cup? I found the dough to be very sticky to work with. I used 500 grams of all purpose flour and I think it needs a bit more than that. There are a lot of factors that could make a difference; the fat content of the butter, temperature of the butter etc. My rule of thumb if I’m making a cut out cookie dough and it’s a bit too sticky, add 1/4 cup of flour at a time until I’m happy with the consistency. Hope that helps! Made these cookies for Thanksgiving. They are absolutely fantastic. They taste just like a brownie. Shared them with friends at a tailgate party. They were the biggest hit. Love your recipes…. Glad to hear it! Thanks so much for sharing! What a great recipe! Mine came out PERFECT! I used special dark cocoa powder for a deeper color. White icing with gold and/or silver sprinkles made the trees look elegant! Thank you for sharing. Hi Michele, that’s great to hear! I’m so glad. Thanks for sharing! I was wondering if I could use salted butter and leave out the salt that is in the recipe? Would that be the same or would that be too much salt in the recipe? Thank you! Yes, that works no problem. Happy baking! I am not sure if I sent this (I don’t remember clicking submit). I made the chocolate cut out cookie. My cookies looked just liked the picture, DOUGH WAS WONDERFUL TO WORK WITH. The cookie tasted bitter, strong of chocolate, and dry…though beautiful. I am a good cookie baker for many years and make a lot of candies and cookies for gifts. I checked and went over the recipe to see if I made a mistake. When I saw the 1 and 1/2 cup of cocoa, I thought that was a lot!….and the recipe was wrong but pulled the recipe off my PC again and that was the amount it called for. The only thing I came up with…was Hershey’s powdered cocoa a wrong choice? (the cocoa was dated 2021). The reviews were wonderful! I wish I could taste one someone else made….I am having a hard time accepting that it was my baking that ruined this fabulous looking cookie…smiling. Any suggestions or advice I would love to know about. Please send to my email inman.rosie@cinci.rr.com Merry Christmas and may God bless you and yours. I’m not sure, it doesn’t have a bitter flavour when I make them. Are you sure the other ingredients were measured correctly? 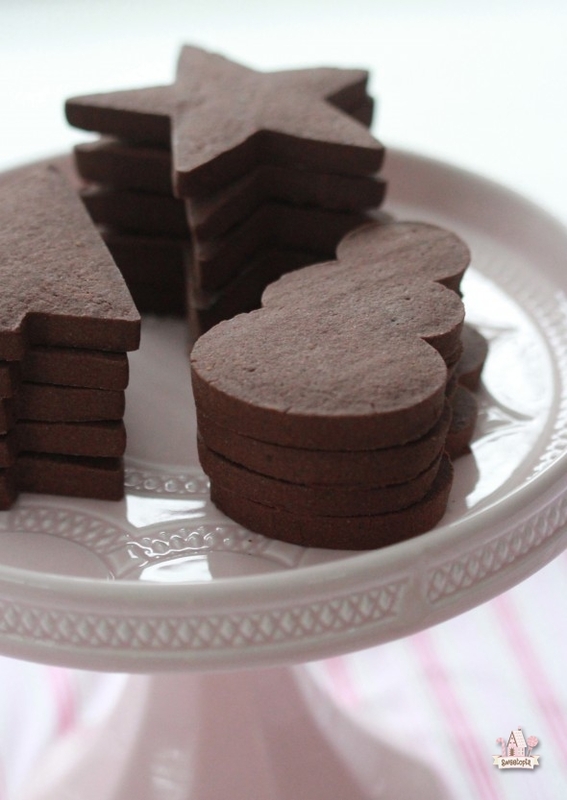 This is the first recipe I’ve wanted to try of the chocolate cutout cookies and noticed you use egg! I’ve never used egg before and was curious why the eggs and what makes the difference using egg? I’ve always used eggs in my sugar cookies, and this recipe is a version of my sugar cookies. My shortbread cookies don’t have egg though. In this recipe, the liquid helps bind the cookie together. Delicious! Perfect recipe! Follow the “chilling instructions.” I will make these again. Such a good cookie, and holds it’s shape excellent. Just need to chill the dough as the instructions say. Best to chill each time you roll it dough out. If it gets too warm it gets sticky. Thanks and Merry Christmas Teresa! I was wondering if these cookies are hard or soft. The comments show different results. I like my cookies softer and I didn’t know if they would be crispy. It depends on how long you bake them. If you bake them longer, they will be crispy.